Firstly I'd like to apologise to all Kate Bush fans right now for the tenuous link and for those who have no idea what I'm talking about be very grateful. This is my newest creation from the Feltie book by Nelly Pailloux, she is Babushka. 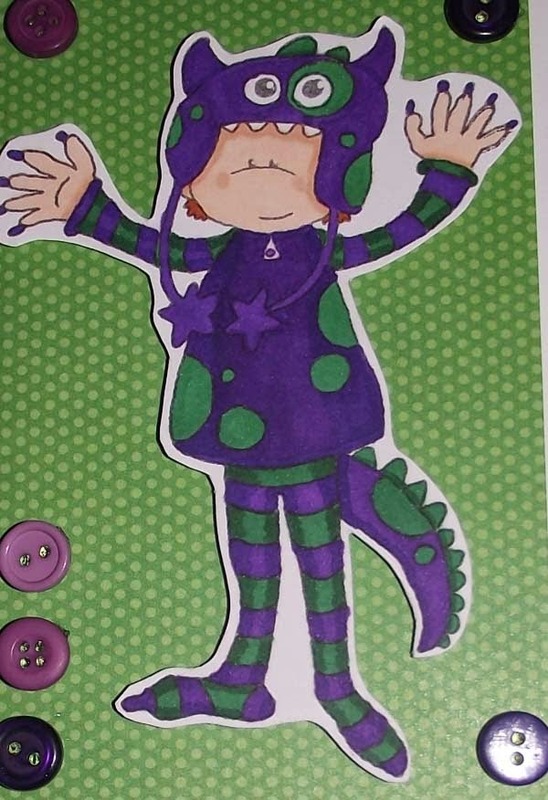 I really like this and as Nelly suggests she can be altered in size to create a set of Russian dolls. She was made using a piece of fuschia felt, pale pink felt and brown felt, sequins, beads and emroidery thread. A couple of years ago I received a kit to make some feltie rabbits, I made a few different versions from the kit (which included pre-cut felt pieces, gems, sequins and embroidery thread). I was really pleased with most of the rabbits but I have to say this one is a bit freaky. I still have a white body and head which I intend to turn into a Rabbid from the video game. I also made a pattern from the pieces so I can recreate the rabbits in better materials. Sleep tight folks don't have nightmares now. 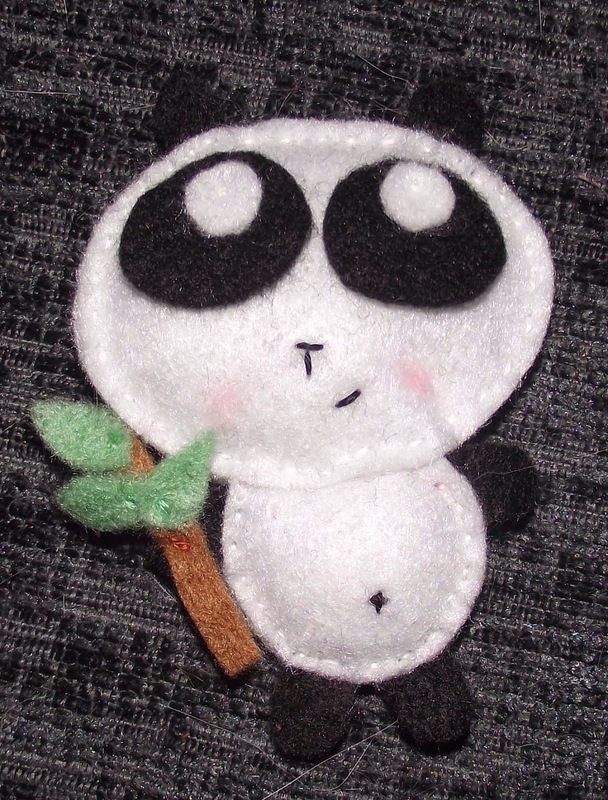 Here is my latest little friend from the Feltie book by Nelly Pailloux. 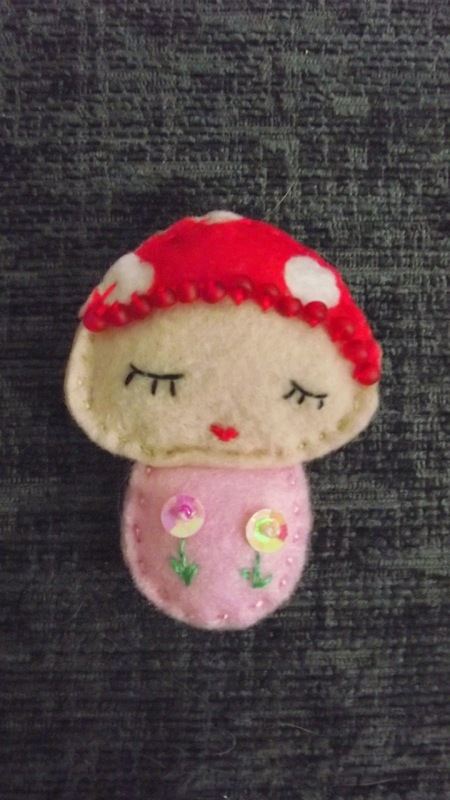 This is Mushroom Girl (yes I think 'Toadstool Girl' would have been more appropriate). She is so sweet and really easy to make with just a few scraps of felt, some beads and different coloured embroidery thread. 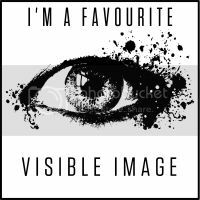 This stamp set is the main reason I wanted to get the Visible Image range in at work. This is Harley the Jester and he is totally cool. I needed to make something with this stamp set but I wasn't sure where it was going but I'm really pleased with the end result. 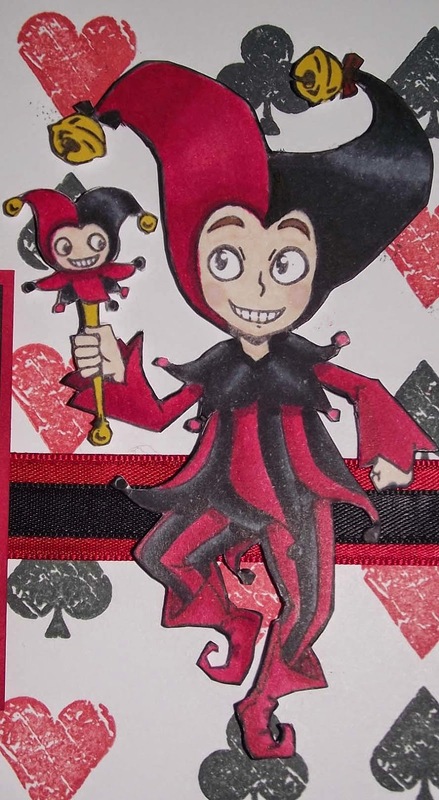 I stamped the background card using the four playing card suits, using red for the heart/diamond and black for the spade/club. 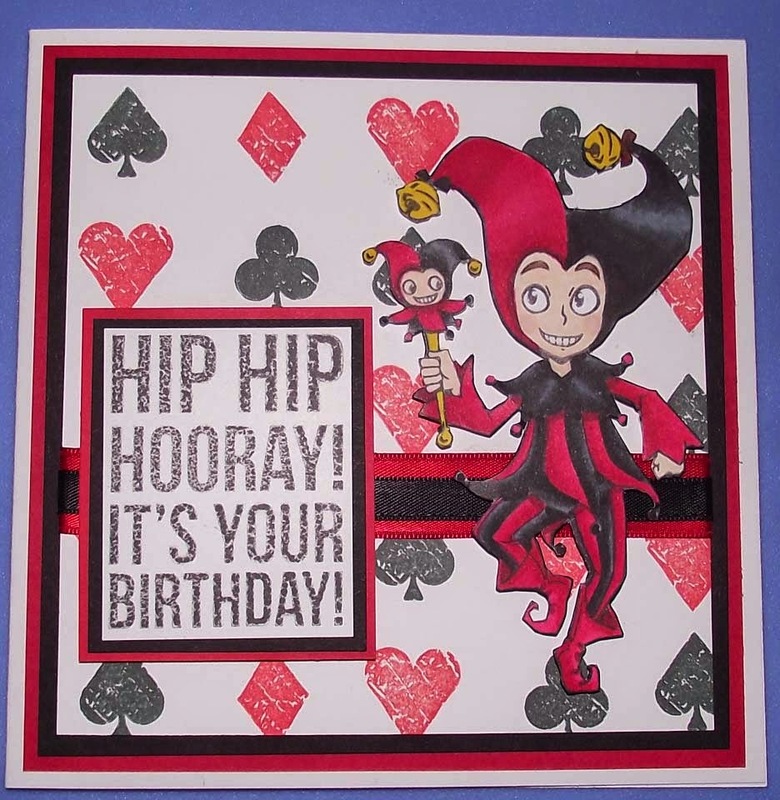 I then added the wide red and narrow black ribbons around the background card. I mounted this onto a piece of black card and then a piece of red card, then finally mounted the whole lot onto a white 6x6 card. Next I stamped the greeting onto white card using a Kaisercraft clear stamp and black memento ink, because this stamp is new it didn't stamp out very well so I was going to throw it away, but I think it fits in with the distressed look of the background stamps. 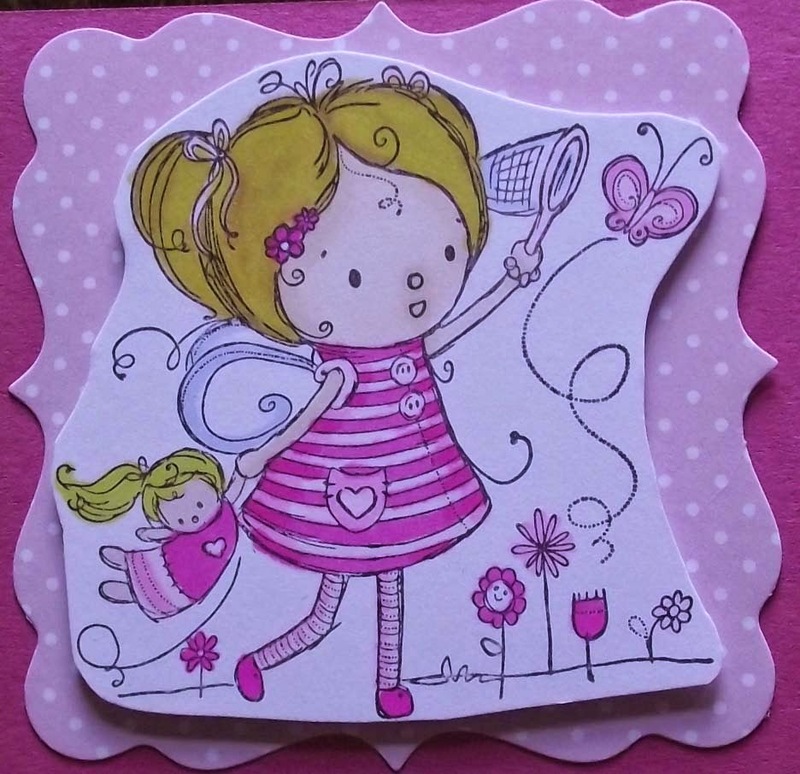 I have become a little obsessed with Rachelle Anne Millers stamps from Crafters Companion. 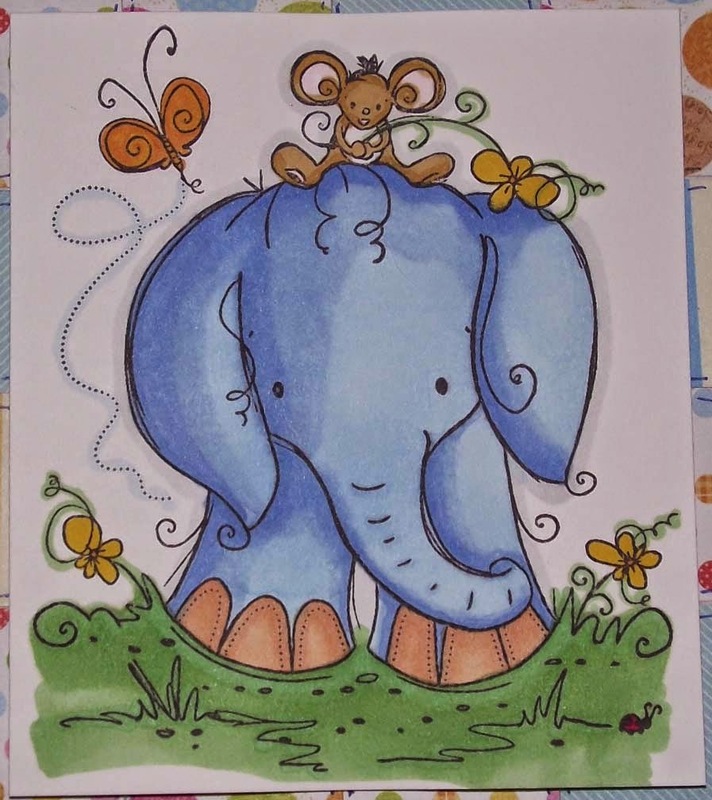 This is one of the stamps from her animal collection called 'Sorry I Forgot', even though it's intended to be used for those cards when we've forgotten a birthday but my Mum is elephant mad so I thought she would really like this. 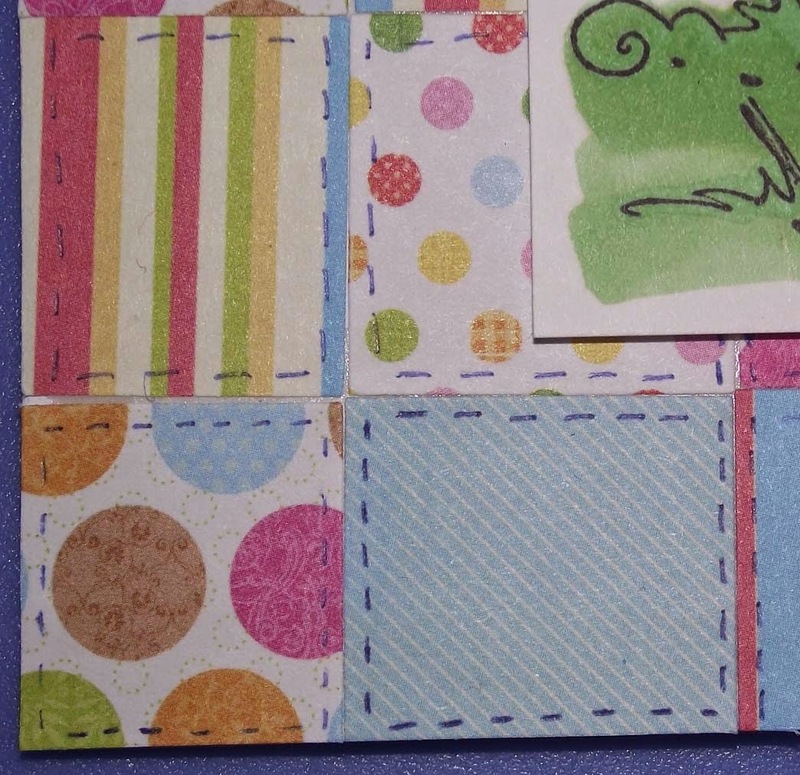 Then came the tricky part, I took four different sheets of paper and cut them into inch square pieces, then stuck them in a random patchwork pattern. I added faux stitching onto each piece using a blue fine liner. I am such a fan of the Gorjuss Girls images from Scottish artist Suzanne Woolcott. I have a lot of these stamps but The Collector is a definite favourite because she is so simple and clean. 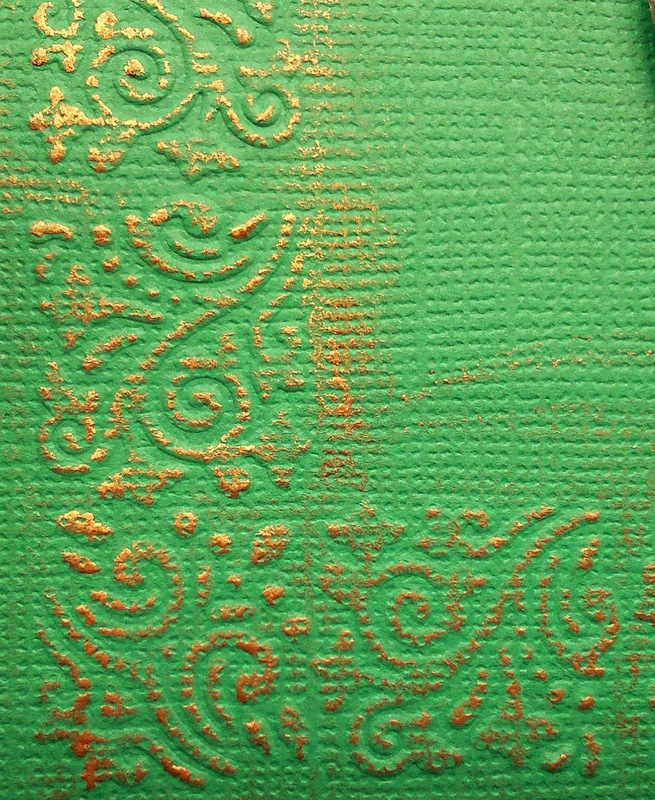 I used the Die'sire Embossalicious Rococo Frame folder on a piece of 6x6 green card and added a copper finish with gilding wax. 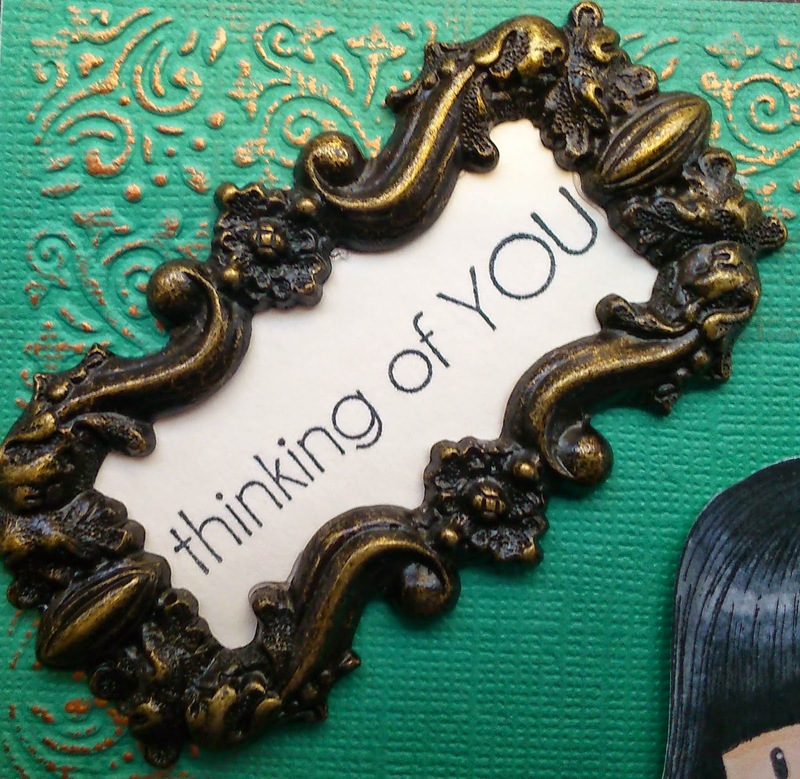 I stamped the 'Thinking of You' using a Kaisercraft mini clear stamp onto white card and mounted a metal frame from the Madame Payraud range from DO Crafts. 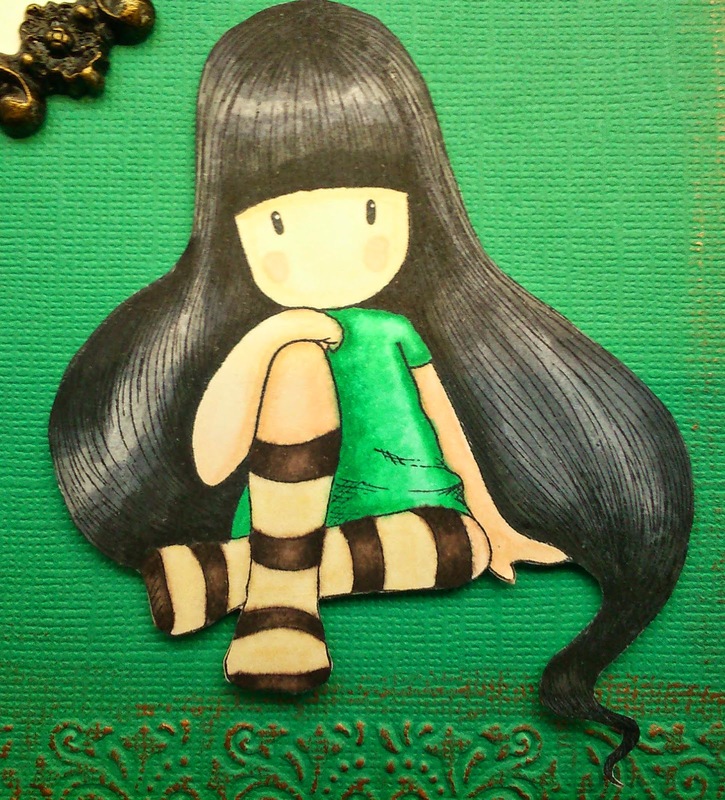 This is one of my favourite stamps from Little Musings. I've used it a few times for Halloween cards but I decided I'd use it this time for my nephews birthday. I stuck a piece of green backing paper to a DL card and mounted the image onto this. The letters were stamped using a set of See D stamps, from DO Crafts, that I have had for a very long time. Well you can't have Thing 1 without Thing 2 so here she is. 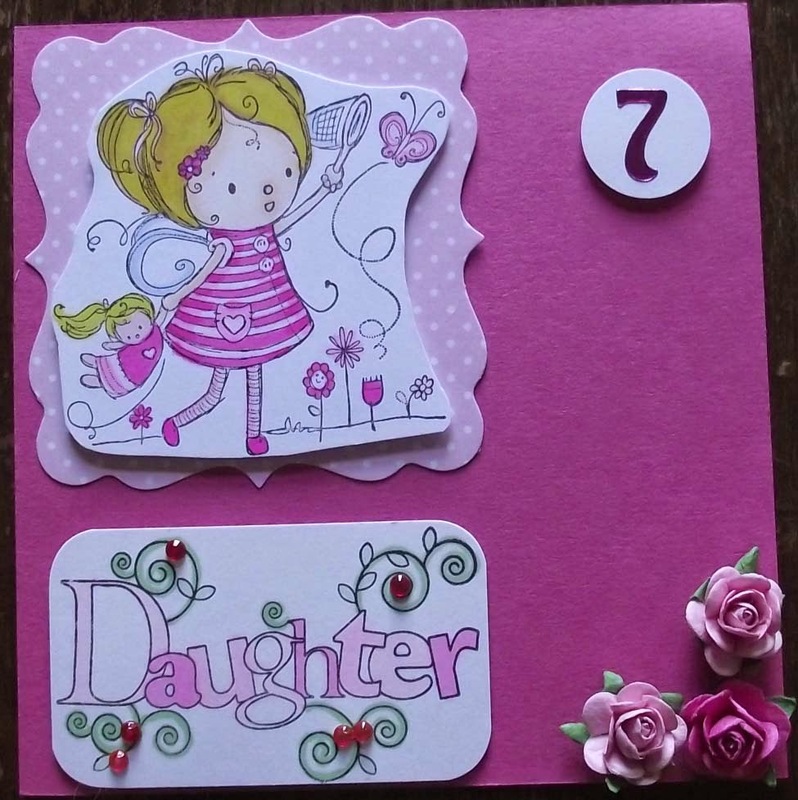 As you probably know I posted a card for one of my twins the other day so here is the one for her sister who is very into pink. 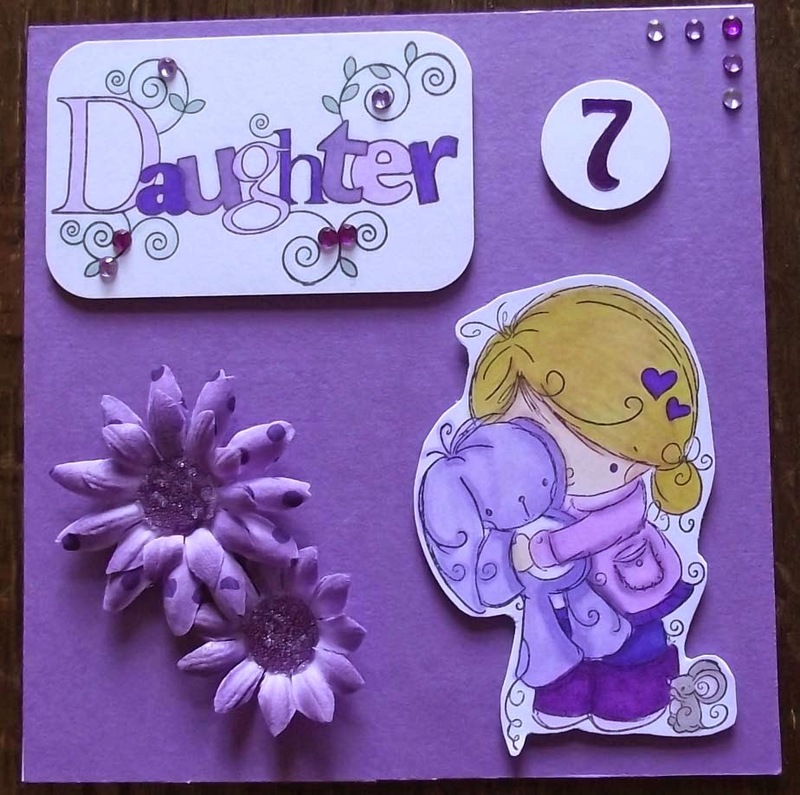 The stamp is also a Rachelle Anne Miller from Crafters Companion called Butterfly Kisses. 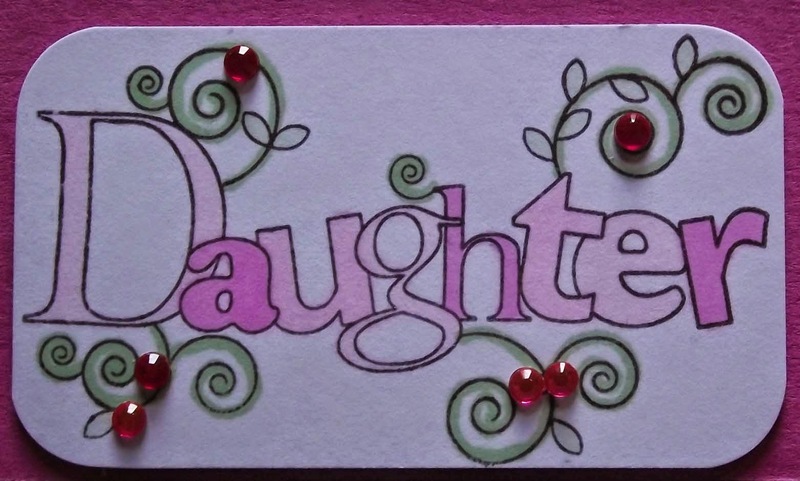 I used the Papermania 'Daughter' stamp again, colouring in with Spectrum Noir pens and embellished it using pink gems. 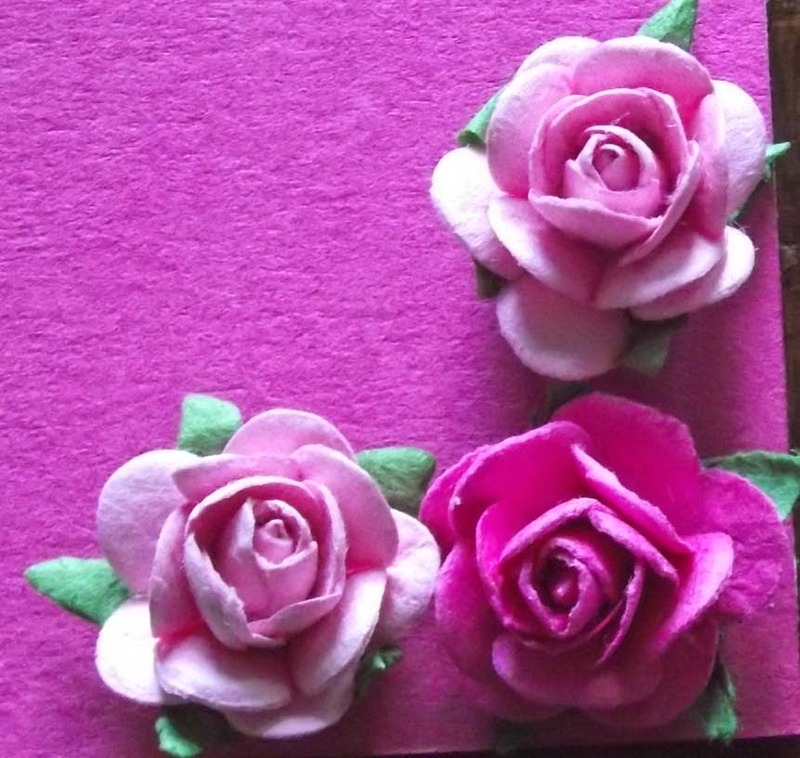 Finally I added some paper roses from Hobby House to give it that little something extra. Here is my latest creation from the Feltie book by Nelly Pailloux ( sorry I've been under the weather recently). 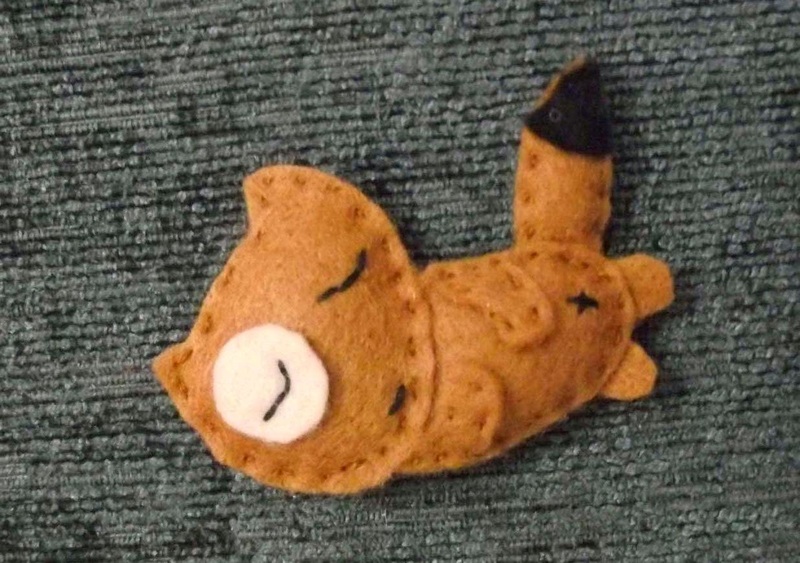 He is a cute little sleeping fox. Once again an easy make, all you need are some scraps of light brown, cream and black felt, as well as black and brown embroidery cotton. I am really enjoying making these animals and can highly recommend the book to anyone who is looking for something quick and easy to make. 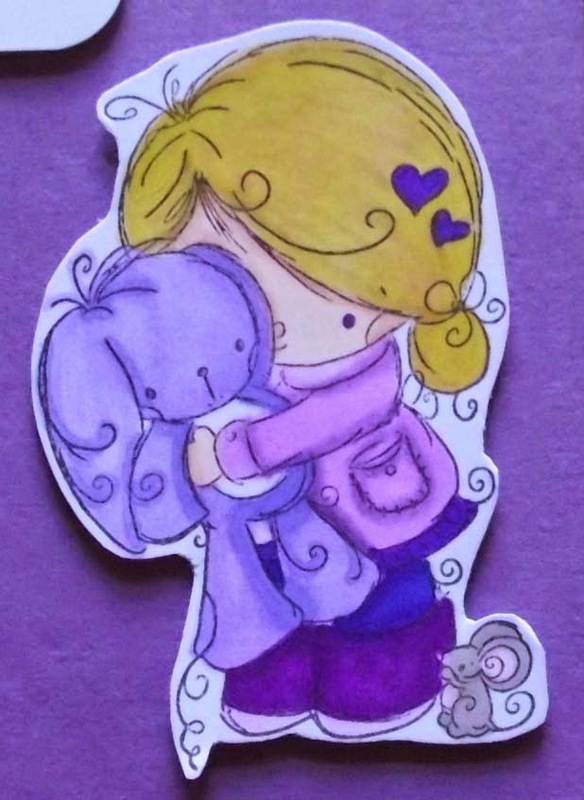 This is a card for one of my twins who loves purple and rabbits so this is the ideal image for her. 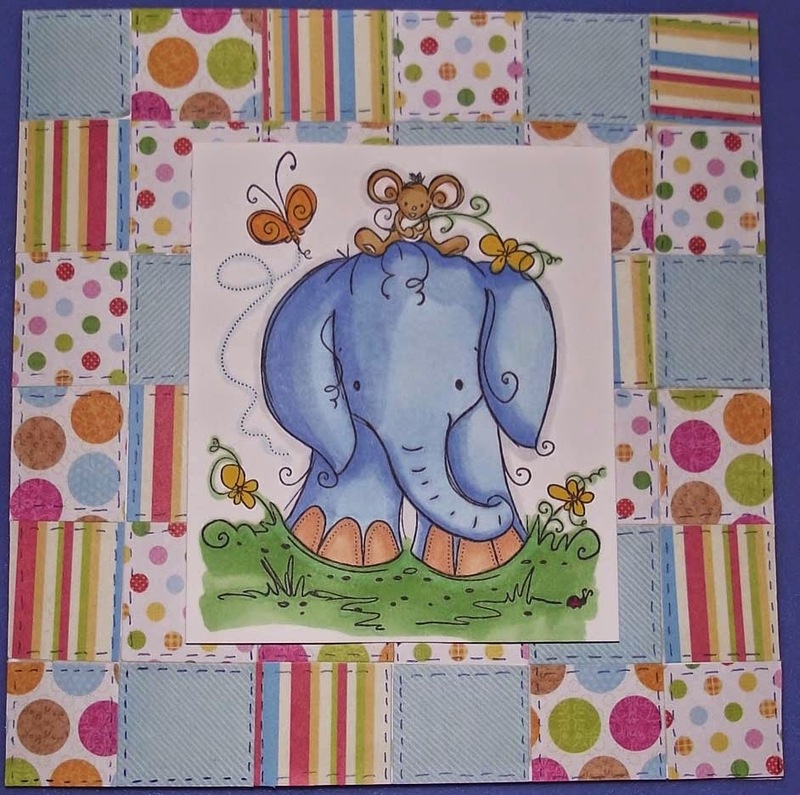 The stamp is one of the new Rachelle Anne Miller collection from Crafters Companion.and is called squeeze. 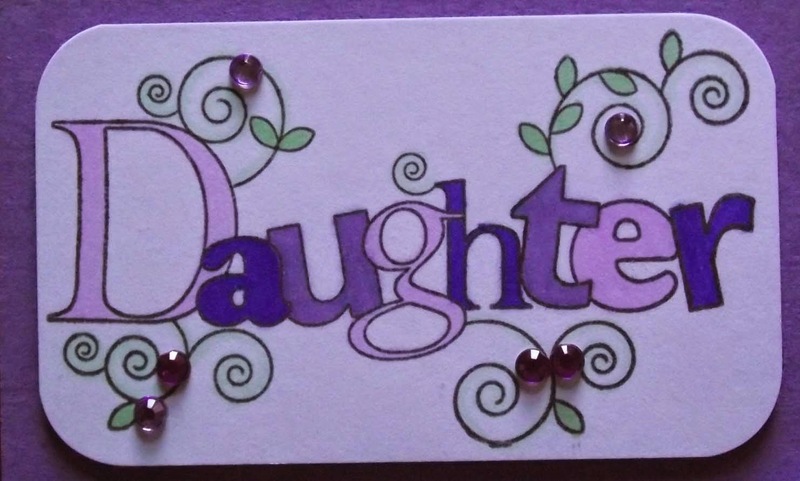 The 'Daughter' stamp is from Papermania and is also coloured using Spectrum Noir pens which I have added some purple and lilac gems to. 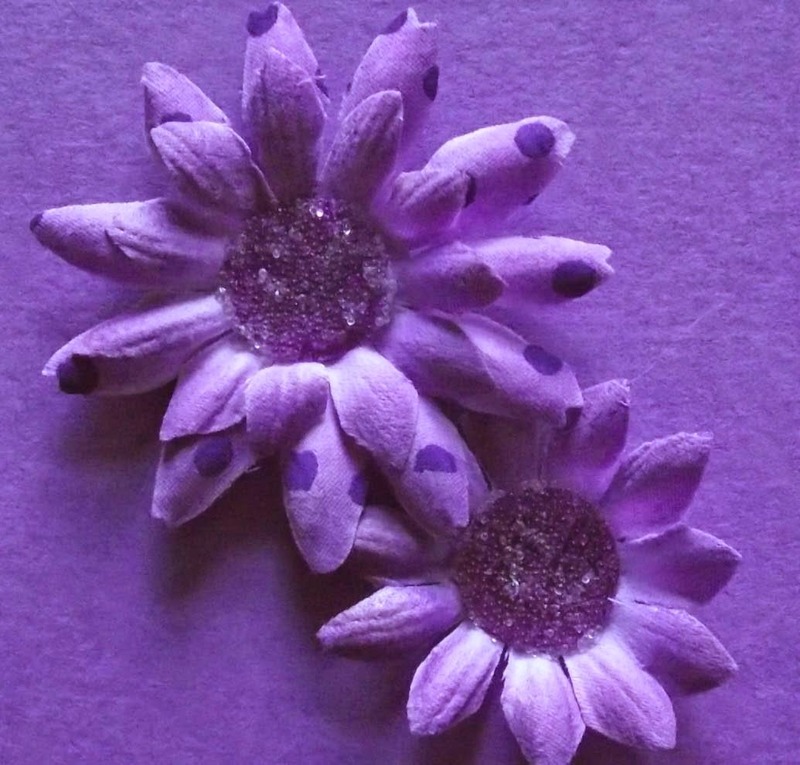 Finally I added a couple of fabric and glitter flowers to the bottom of the card. I have to say I almost threw this away in it's early stages but my little girl really liked it so I'm glad I didn't. So to start with I took a piece of pale blue A4 card and printed the words onto it, then cut each set of words down to size. Next I took a piece of 12x12 white card and drew three wiggly lines on it. I added to small lines at each end to give it a twiggy look, I stuck the pieces of blue card to each end. 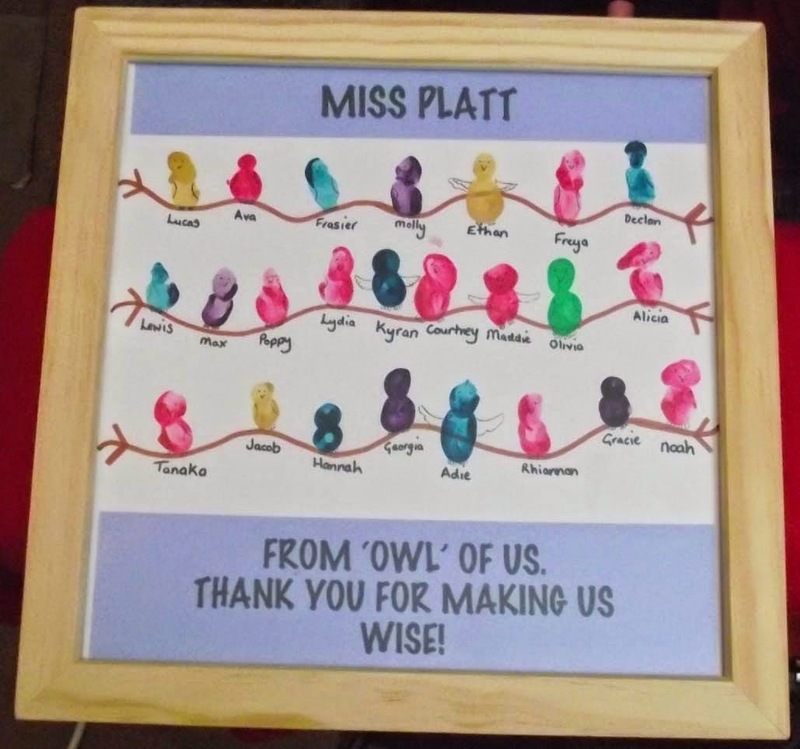 Then came the good bit, each child choose a colour and used their thumb and forefinger to create a head and body. I then wrote the child's name underneath before I forgot (heehee!) I left the whole thing to dry before using a black pen to give each owl a beak, eyes and wings. As you can see I had to get a little creative with the few owls that seem to be wandering off. I bought a 12x12 box frame from Wilkinsons (as it was the only one I could find) but I took the square of wood out to put the picture in before putting it back to stop the picture slipping. And panda makes three. So as promised here is my latest creation from the Feltie book by Nelly Pailloux. 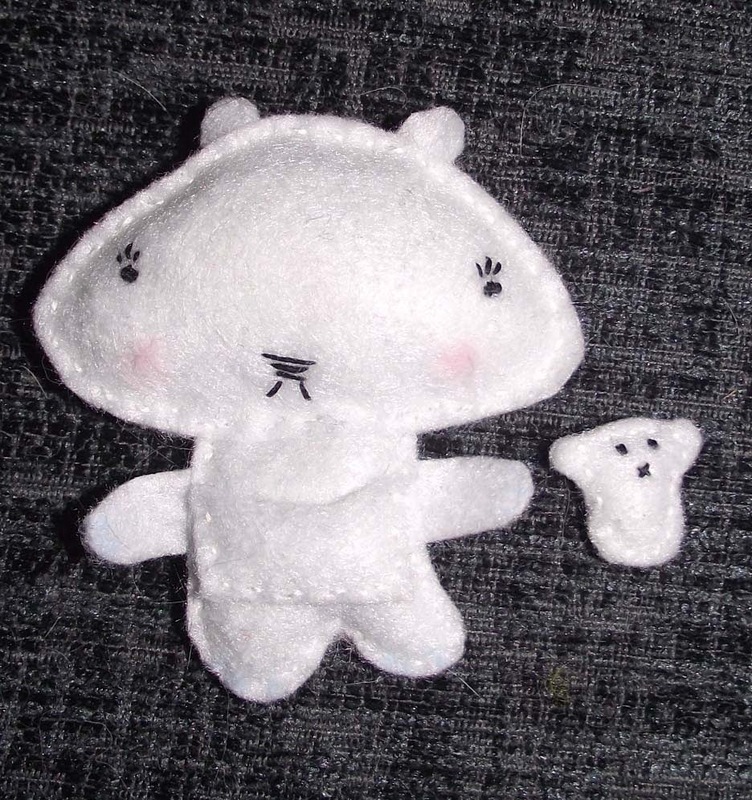 Once again really easy to make using a few scraps of felt, embroidery thread and toy stuffing. I've really enjoyed making these guys and have been thinking they might make sweet brooches. Don't worry this isn't the last you'll see of these the book boasts 18 cute and fuzzy friends. 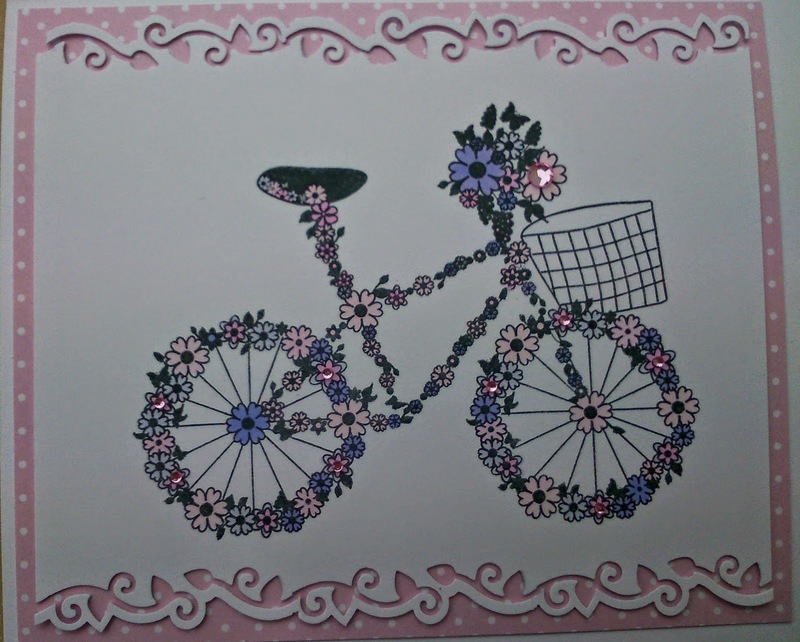 I added a few pink gems to the flowers on the bicycle just to give it a bit of bling. Next I used the English Ivy Edger punch from EK Success to create a fancy border along the top and bottom of my white card. 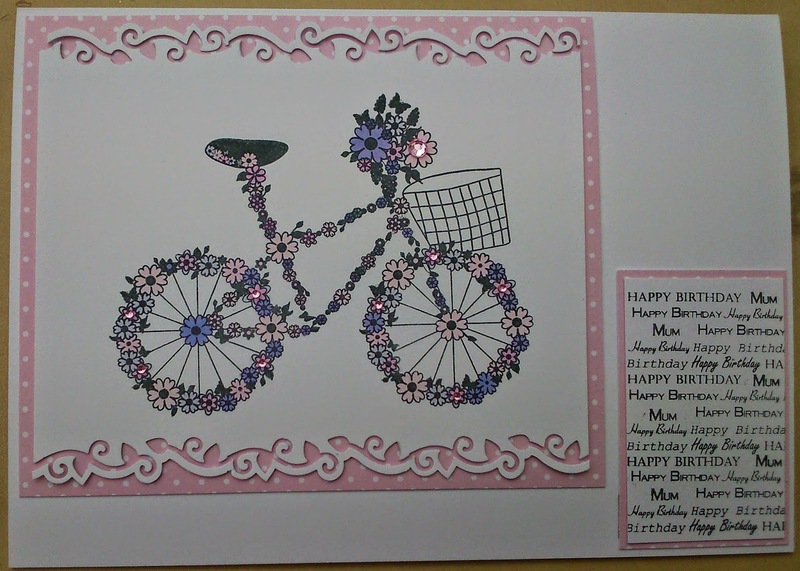 I layered the image onto a piece of pink spotty card, also from Anna Marie Designs. The text stamp at the side of my card is actually really clever, it is also from Anna Marie Designs (are yiou noticing a theme here? 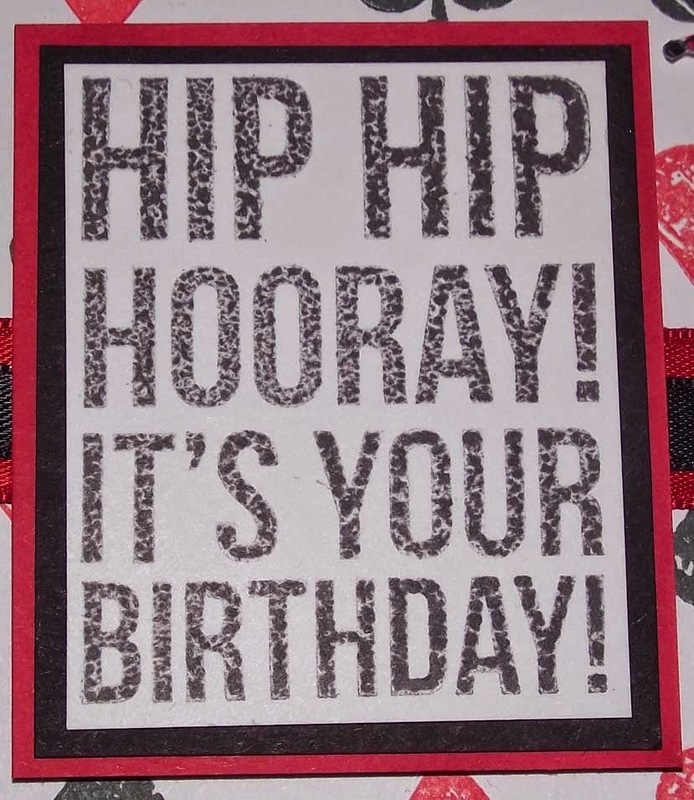 ), the text stamp has gaps so you can use any of the other stamps to personalise the card. This happy birthday one has To My Mum, To My Sister as well as loads of others. 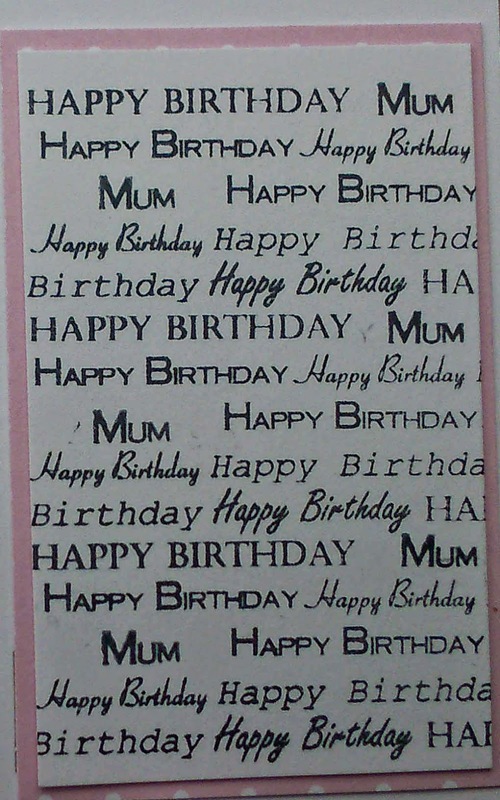 So I stamped just enough to fit in the space I had, then used the Mum from To My Mum to create my greeting. I layered my greeting onto the smae pink spotty card and voila my finished masterpiece. 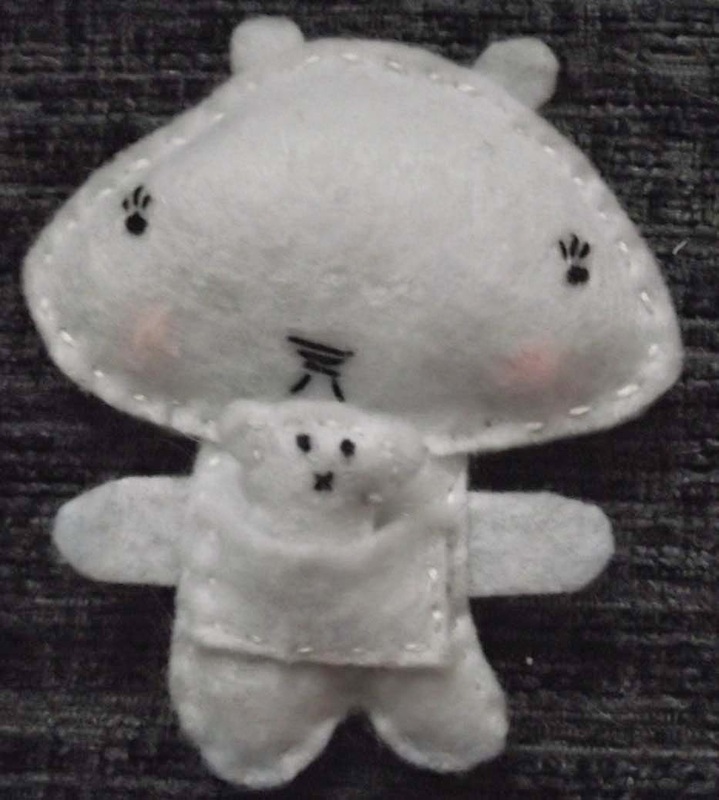 A couple days ago I showed you a picture of one of my creations from the Felties book by Nelly Pailloux so I'm back to show you my next little friend, she is a beauty and so is her little one. This is Polar-roo with her little joey/cub in her pouch. 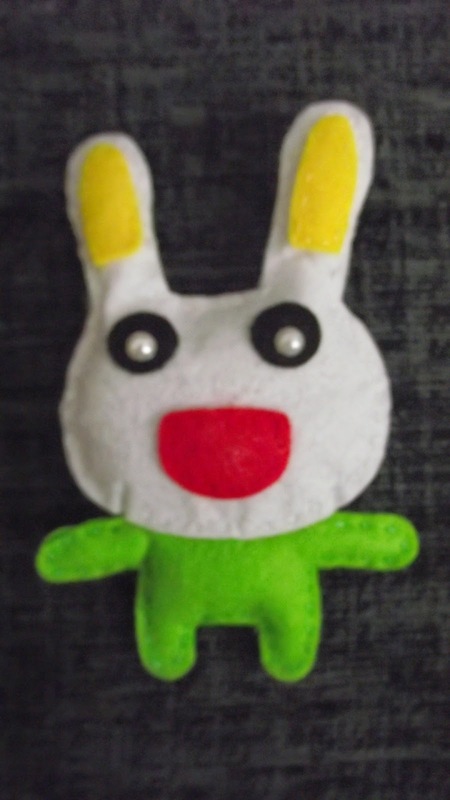 She is about 3inches tall and is made using white felt, embroidery thread and a tiny amount of toy stuffing. The cute thing about this particular feltie is the cub is detatchable. 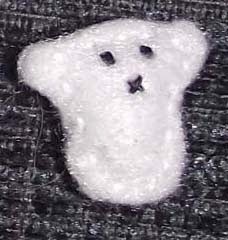 I have to say this has to be the smallest thing I have even sewn in my life and as for stuffing the little tike, oh the fun. 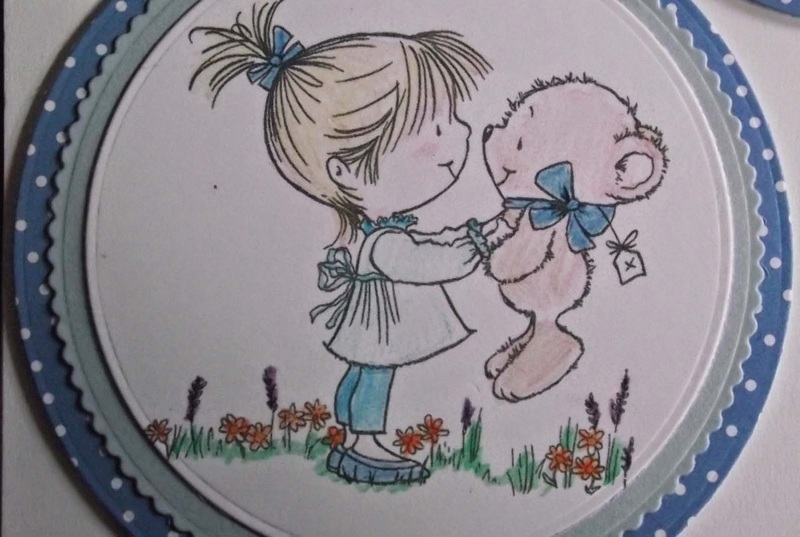 So this is my Mother's Day card for my Mum, she's loves teddy bears so when I saw this image from Wild Rose Studio knew what I would do with it. So I used my Tonic circle dies to cut the image out before I coloured it in using ordinary colouring pencils, I like the subtle colour of pencils. Then I cute a slightly larger scalloped circle from plain blue card and another slightly larger plain circle from a piece of blue spotty card from Anna Marie Design, I think I'm in love with this range of card. 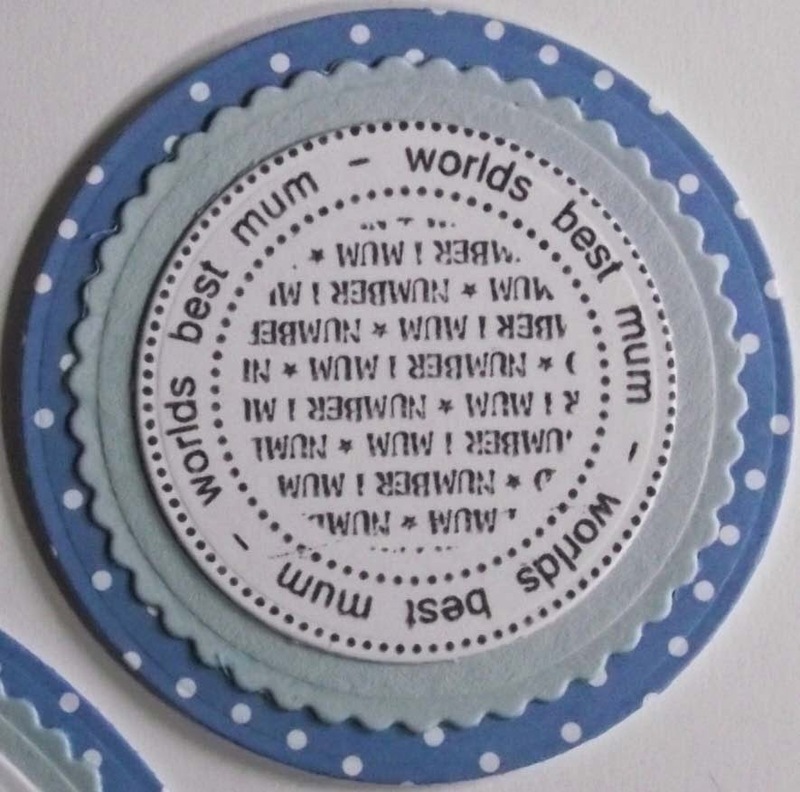 Then I stamped the Worlds Best Mum image, from Stamps Away, onto a piece of white card which I cut and layered in the same way as the main image. Finally adding some little gems on two corners to give it a little bling. However eyes keener than mine where at the time will notice my glaring error, yes I put it on upside down. Unfortunately I didn't notice it until my Mum pointed it out to me after she opened it. Ooops!